On 17th July 2018 about 80 families, including children and elderly left behind the brick houses they have been living in, with water, toilets, furniture, kitchen and other household goods, and moved to live in tents in a forest like area. The move was to resettle in their beloved, traditional village, Mullikulam, after nearly 11 years of displacement due to Navy occupation of the village. Throughout this period, while struggling to survive without the resources Mullikulam provided, the villagers also battled to regain their lands, with many negotiations, meetings, petitions, letters and protests. The responses were mostly betrayals and broken promises, by the present and previous governments. The 27 houses are yet to be released. This is why people had been compelled to live in tents, in forested and bushy areas of the 77 acres that has been released. They face dangers from snakes and elephants, as well as dust, sun and rainfall that may come soon. There are electricity lines to the Navy buildings, near to where they live, but they have no electricity and this exacerbates night time dangers. They have to go a couple of kilometres to have a bath and are dependent on minimal toilet facilities at the nearby church and school. Most painful for some villagers is to see their own houses occupied by the Navy, just a few metres away from their tents. An elderly villager showed me his brick house now occupied by the Navy, just across the gravel road from the tent he is now compelled to live in. His two sons and a nine month old grandson are among those living in tents. Another grandson born last Sunday and his mother, are unable to come and live in the village in their house, due to Naval occupation of the house. Mullikulam has been a prosperous and picturesque village in the Mannar District, with a population that’s entirely Roman Catholic and of Tamil origin. It is a traditional fisher and farming village, with forests, tanks, irrigation schemes and open access to the sea enabling food security and steady income. The war resulted in the displacement of villagers in 1990, but many returned after the 2002 Ceasefire Agreement and started to rebuild their lives, livelihoods and restore their destroyed houses and property. In September 2007, the people of Mullikulam were forcibly removed from their village and the entire village was taken over by the Army. The villagers were assured that they could return within three days. Nearly 11 years after, the people of Mullikulam have yet to be allowed to return home and the status of return remains indefinite and uncertain, due to the Navy having established their Northwestern Command Headquarters and Naval Institute (SLNS Barana) at Mullikulam. 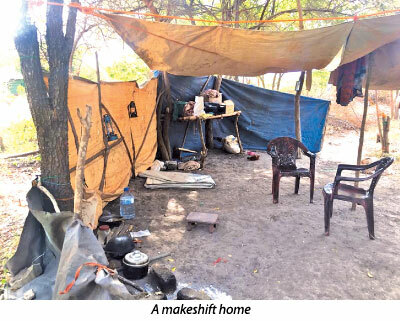 During these 11 years, the approximately 300 families (besides about 100 in South India), have been living on rent, in temporary shelters/camps, or with host families/relatives, in and around Mannar. Some have accepted alternate land and housing. 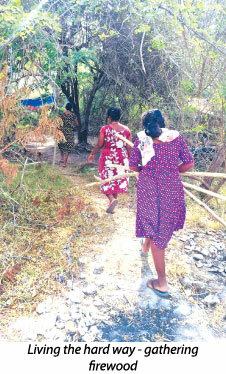 Most want to return to live in Mullikulam. Despite the nearly 11 year old wait, immense sufferings and broken promises, villagers have still not given up hope of having their village restored to them, which led to the latest move last month. Civil authorities in the area must step into to provide the most urgent needs for those who moved to Mullikulam, such as electricity, toilets and bathing facilities. The situation in Mullikulam has also been brought to the attention of the President, who is also the Commander in Chief. He must ensure that the Navy keeps its promise and immediately release the balance 23 acres of land and 27 houses, plus the 300 acres they had “earlier consented to release”. Although what is needed is nothing less than the release of the Mullikulam village as soon as possible, it would be important to prioritise land that people judge to be most important for traditional livelihoods, public purposes and residencies. It is also important to establish a regular consultative process about land releases with Mullikulam people, that’s led by civil authorities, respects people’s right to communicate and receive communications in Tamil, maintains transparency with written records of discussions and agreements, provides regular written updates on progress being made and responds to queries. The Government must also try to provide the displaced people with material and financial assistance to rebuild their lives, including the return of boats, nets and other resources they had left behind when the Army occupied the village, rebuilding or improving village infrastructure including schools, medical centres and other amenities and ensuring equal access to common property and resources. Note: the writer has been visiting and working with Mullikulam community since their displacement in 2007. Below are two of his previous writings that provides more background information.